There were several important reports on the economy released this morning. 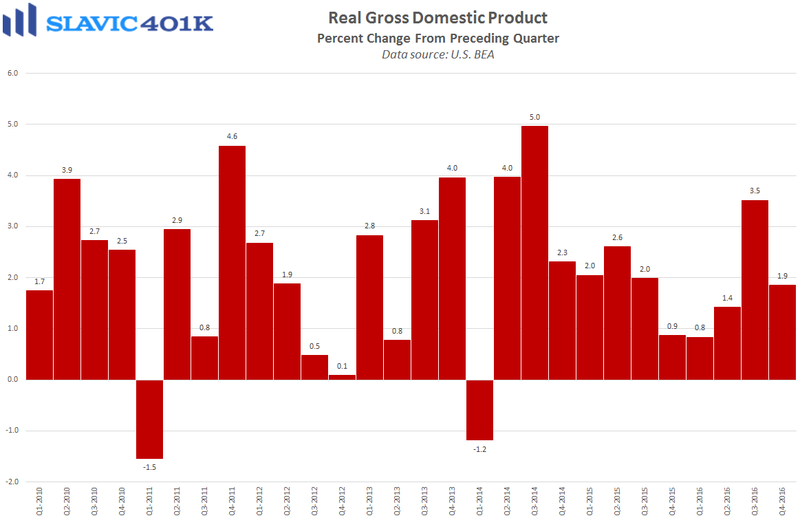 First, data from the Bureau of Economic Analysis (BEA) showed that U.S. gross domestic product (GDP) growth during the fourth quarter of 2016 was unchanged from its initial estimate. Specifically, real GDP, which measures the value of the production of goods and services in America adjusted for price changes (inflation), increased at an annual rate of 1.9 percent in Q4. That matches January’s advance estimate but is below the 2.1 percent upward-revision that economists had expected. Headline growth was unchanged due to offsetting revisions under the hood. 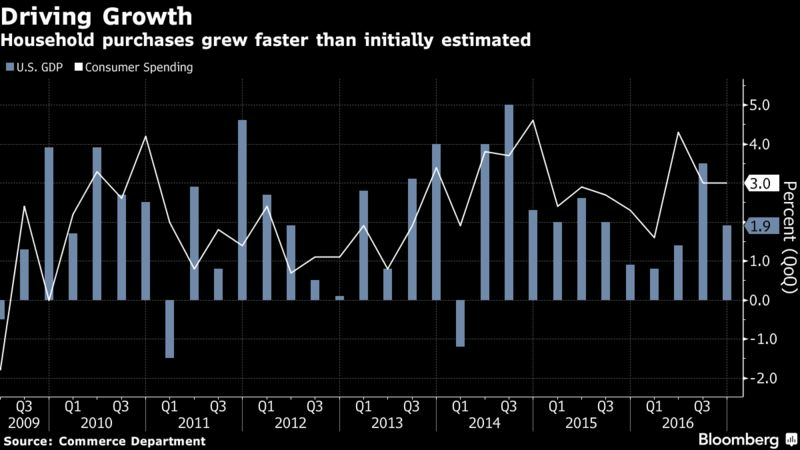 The biggest drag came from softer investment by businesses and state and local governments in Q4, while consumer spending, which accounts for about two-thirds of U.S. economic output, expanded at a much faster rate than previously estimated. 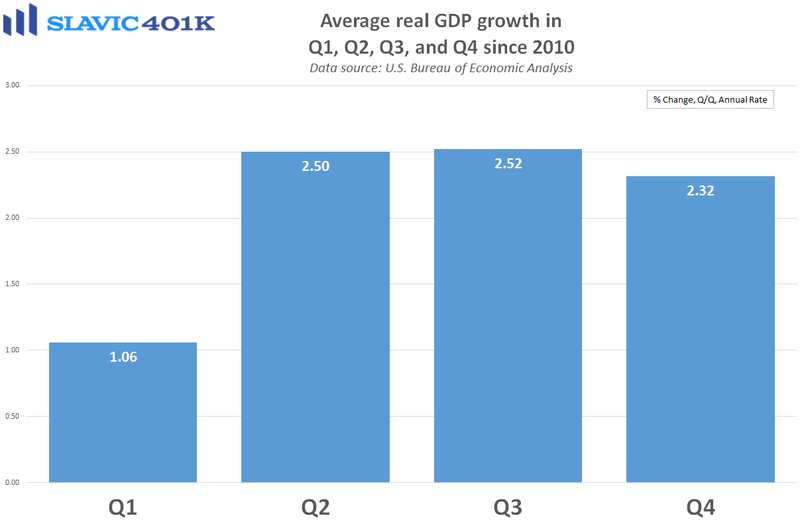 Altogether, it is clear that the U.S. economy is still doing good but not great, as Q4 GDP growth was disappointing following the third quarter’s 3.5 percent pace of expansion, and frustratingly weak compared to previous business cycles. On the bright side, Federal Reserve researchers currently project that GDP growth will accelerate to 2.5-3.1 percent this quarter, a welcome turnaround from the recent seasonal pattern of a Q1 slowdown. 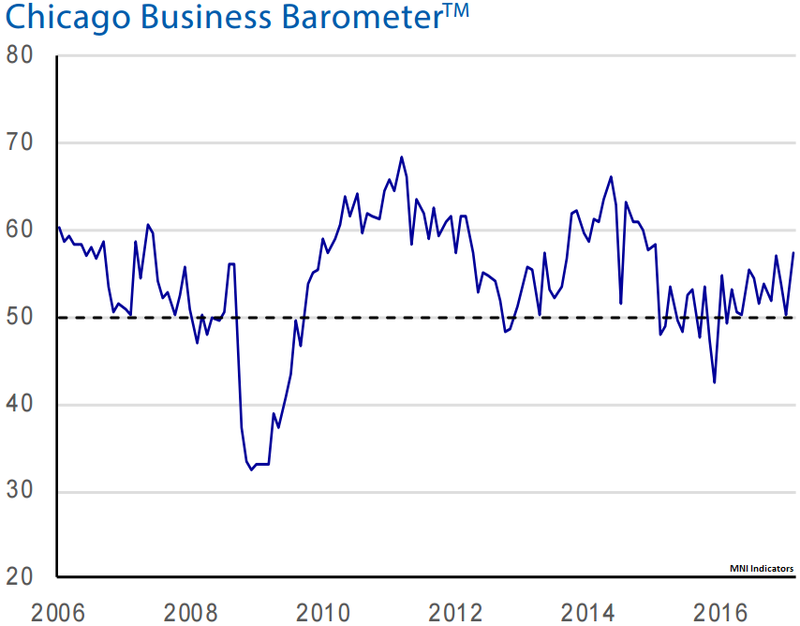 Next, the Chicago purchasing managers’ index (PMI) from Market News International (MNI), a measure of regional business activity that is often viewed as an indicator for the overall U.S. economy, jumped to 57.4 in February. That was a much larger rebound than expected following January’s sharp decline to what is now the highest headline reading since January 2015. Under the hood, supplier deliveries fell but measures of new orders, production, order backlogs, and employment all improved considerably this month. The prices paid (input costs) index jumped to the highest level in roughly two and a half years this month, and inflationary pressures at the factory gate increased for the third month in a row. 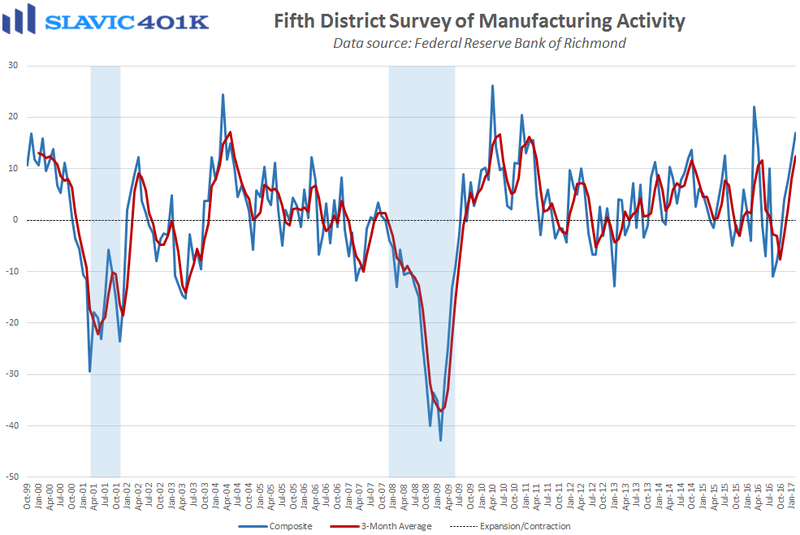 Shaily Mittal, senior economist at MNI Indicators, added that “With inflationary pressures on the rise and the job market having improved, the next rate hike could come soon, possibly in the coming quarter.” Similarly, a new report from the Federal Reserve Bank of Richmond revealed that manufacturing activity in the Mid-Atlantic region of the country continued to expand this month, with the composite index rising to the highest reading in almost a year. 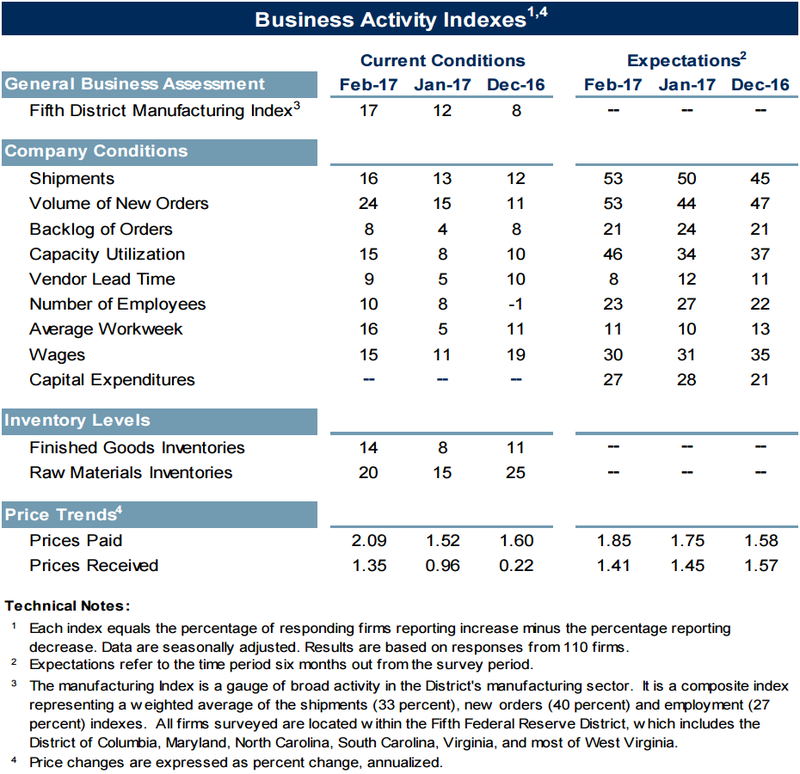 Measures of shipments, new orders, order backlogs, capacity utilization, total employment, hours worked, and wage growth all improved in February, while capital expenditure plans moderated.